GuruAid is the Technical Solutions Division of Lester Inc, a company incorporated in 1981 in the U.S. and based in East Haven, Connecticut. Our mission is to make technology work for small businesses and connected homes. Users are grappling to keep pace with the blistering pace of innovation in information technology. We help customers deal with this complexity. We help customers deal with this complexity by assisting them in product purchase, deploying technology, learning to use technology, and troubleshooting complex problems so as to make IT hassle free. GuruAid Shop's mission is to make hardware and software purchase easy and less confusing. It is hard for most people to keep pace with the blistering change & innovation in information technology. GuruAid Shop Advisors will guide you in selecting the best products that meets your needs. Our technical staff will install and setup the products, and even troubleshoot technical problems. Our partnerships with Tech Data, Ingram Micro, Dell, and others ensure that you get the latest products at prices that are hard to beat. The age of smart, digitally connected homes is upon us. Today multitudes of interconnected devices secure homes, save energy, manage entertainment, and perform health monitoring. Trust us to help install, configure & run these devices without a hitch. GuruAid Support provides high quality independent technical support to consumers by using a proprietary knowledge repository; software tools to detect and fix problems automatically, and certified trained technologists. Some of the support services offered by us maybe available for free from the vendor. Use of trademarks is for reference only. Lester Inc is a premier Technical Solutions and Business Services Company incorporated in 1981 in the U.S. and based in East Haven, Connecticut and employing 800 professionals across US and India. Lester leverages two key trends in the internet and technology industry - explosion of social content on the Internet and cloud technologies to offer innovative solutions to address the needs of our customers. Lester's solutions help human resource professionals manage college recruitment and optimize talent; marketing and sales professionals connect with customers using traditional and digital marketing; and consumers and business purchase, deploy, learn, and use information technology. Check some of our customers. Computer has become a part of our personal and professional life. Generally computers come preinstalled with Windows, device drivers, and other required software. However they still require additional configuration for optimal use. Additionally, you may require installing new software applications for your personal or professional use. Similarly upgrading an old computer with Windows XP to Windows 7 or Windows 8 is not easy. The product installation instructions are often confusing. Our experts can help install and configure your desktop or laptop computer the way you want. Computer hardware and software are becoming more advanced and complex. 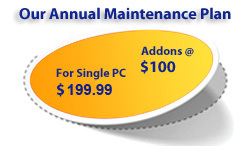 We can fix most of the software problems for your computers, laptops or desktops. For example, say your Windows update unexpectedly stops working; or a nasty spyware cannot be removed; or email attachments are not opening; your browser is crashing. No matter how complex the problem, you can count on our certified technicians to spend as much time necessary to fix the problem until you are completely satisfied. Computer software products can get bloated after some time. As you surf the net, download apps, add new programs, and clutter your computer with unnecessary data, you will slow down your computer. Malicious spyware & viruses become home to your computer. Simple tasks such as starting and shutting down Windows can take long time. Internet Explorer or other browsers may become sluggish. Our technicians know all the tricks of the trade to clean-up, speed-up and tune-up your PC so that it regains its past glory. Most of desktop and laptops are preloaded with Microsoft Windows line of operating systems. Some software like Windows firewall, or backup & restore utility, diagnostic tools like event viewer and task manager are bundled with Windows. Other such as Microsoft Office, antivirus from McAfee or Norton are paid software you may have added. Still others like browsers or apps like Skype are free tools downloaded from the web. This software stack is becoming quite complex. You need someone like GuruAid who can help you make sense of the new feature-functions and guide getting the most out of your computer. Surface Pro 3 review: Has Microsoft finally made a tablet to replace your laptop? GuruAid is an independent provider of remote tech support for third party products. Any use of third party trademarks, brand names, product and services is only referential. GuruAid hereby disclaims any sponsorship, affiliation or endorsement of or by any third-parties. If your product is covered by warranty, the support service maybe available for free from manufacturer. Our Money-Back Guarantee policy ensures your satisfaction. If the Technical Support Gurus could not perform in accordance to service specifications (read our terms and conditions for more details) and you're not completely happy with the service you've purchased, you can get a full refund within 30 days of initial registration.